Rubens’ Elevation of the Cross is a well-known triptych that was commissioned in 1610 as an altarpiece for the Cathedral of Our Lady in Antwerp. In many respects it embodies the very essence of the Flemish Baroque style in its grandeur, monumental size, powerful use of colour and chiaroscuro, and heightened emotional intensity. Motion, time and space are combined in the painting and portray a truth that transcends time and space. The Catholic Reformation is the immediate social and religious context of this work. At the time this painting was commissioned, the Catholic Church had embarked on a project of reinvigorating its mission to evangelize once again the masses to the saving work of Christ. The stellar example of this is the missionary movement of the Jesuit order that was founded in the century before and had a deep influence on Rubens. Sacred images were seen as important visual reminders of the Church’s teachings, for they were to encourage religious zeal and participation. 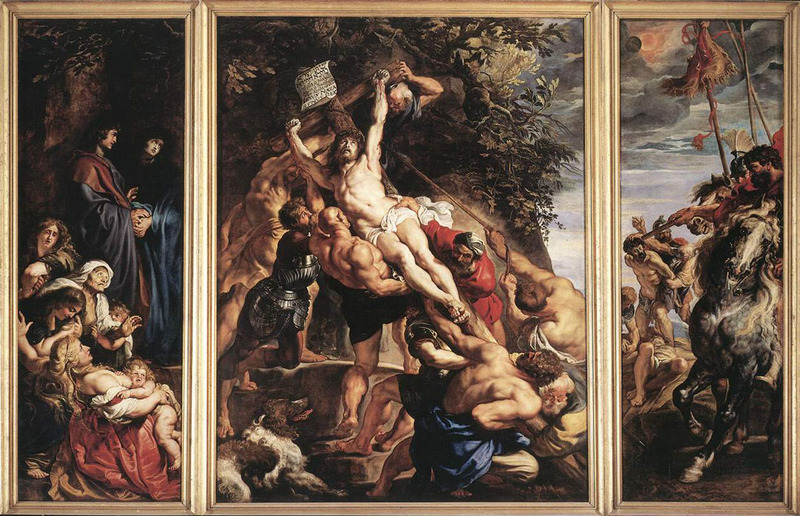 Rubens himself was a devout Catholic who went to daily Mass, and his religious paintings, such as the Elevation of the Cross, seem clearly connected to his own personal faith in Christ. In the central panel one can see nine muscular executioners who, seemingly with extreme difficulty, attempt to lift Christ’s pale body onto the wooden cross. Why are they having so much trouble? It seems that Rubens is representing the spiritual reality that Christ carries the weight of the sins of the whole world. A dog pants as if incredibly agitated in the left-hand corner. Dark trees and a colourful sky appear foreboding in the background. The living oak tree, which twists and turns in an overabundance of branches, points to the fact that the cross of Christ is the fulfillment of the tree of life. The ferns can be seen to symbolize humility and the dog faithfulness. Light shines down on Christ, the ultimate victim, who in his agony looks up to heaven. In the left panel we see in the background the Blessed Virgin Mary, who has her eyes fixed on her Son, and St. John, whom Christ gave to his mother. In the foreground a group of Christ’s followers are gathered around in mourning, one of whom, if we follow her gaze, brings us directly back to Christ. In the right panel a Roman officer sits on horseback while behind him soldiers are crucifying the two thieves. Rubens paints his own features into the face of the soldier who gazes, with wide-open eyes, toward the horror that is taking place before him. He seems to be showing that he, like all of us, participate in the crucifixion of Christ every time we sin. Yet, despite the horror of it all, Christ is victorious. As we contemplate the Lord’s Passion at the climax of this Lenten season, may our hearts and minds grow in humility, awe, and love for our Savior. Let us pray: we adore you, O Christ, and we praise you, because by your holy cross you have redeemed the world. Peter Paul Rubens: Elevation of the Cross, 1610-11, oil on wood, 4,62 x 6,4 m.
Peter Paul Rubens (1577-1640) is the most eminent of northern Baroque painters, sometimes called “the prince of the Counter-Reformation artists”. He was both prolific and in high demand; the years 1609-14 saw him complete more than fifty important works. Among these, his Elevation of the Cross (1609-10) and Descent from the Cross (1611-14), much larger works than his Resurrection (1611-12), all done originally for the Cathedral of Our Lady in Antwerp, where despite removal during the French Revolution they now again reside. Esther Wilke is an education student at Trinity Western University in Langley, BC, Canada. She aims to inspire in her students a love of the three transcendentals: truth, beauty and goodness.